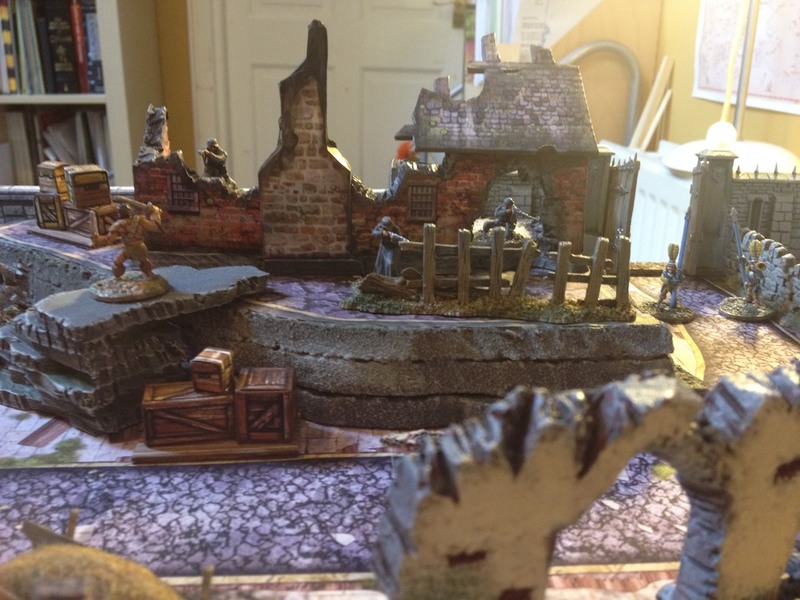 I’m not a terribly focussed terrain builder/maker as is probably evident from the end results of my tables. 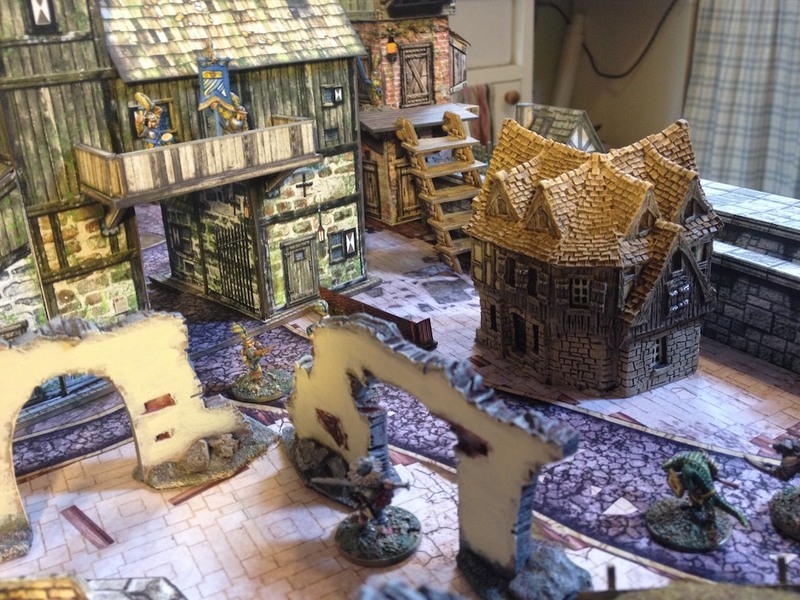 They tend to evolve and acquire increasing amounts of clutter over time without a great deal of consideration for consistency – I’ll mix resin, plastic, card, paper and foam core with 2d and 3d to suit. The base for this table are 10″ square wooden panels. They were cut down from ‘left-over’ slotted panels used on wooden wine cases that I use as shelving for paints and miniature storage. 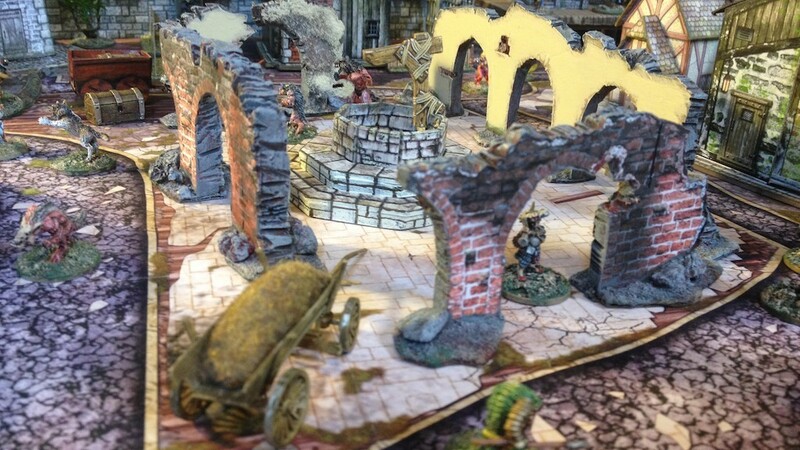 They have a magnetic sheet covering and on top of that I printed out a portion of Pwork Darkburg paper terrain battlemap. 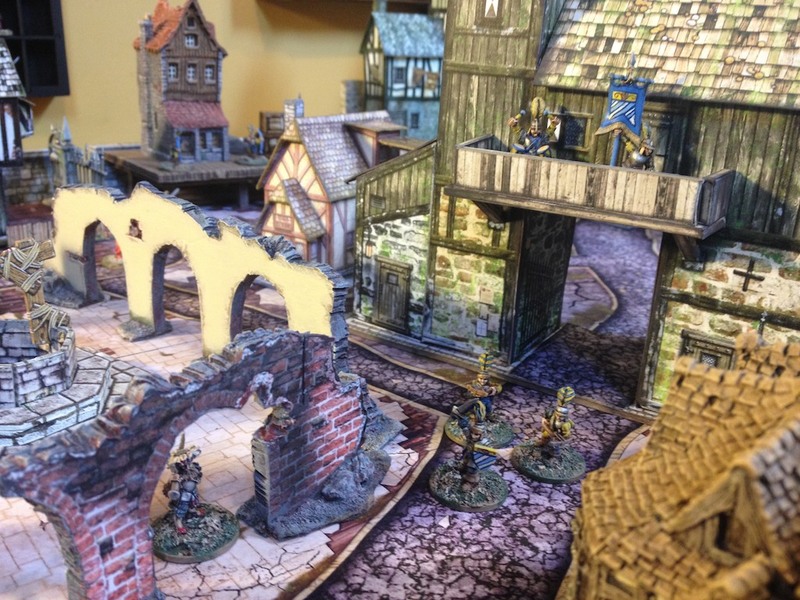 Very Mordheim in flavour. 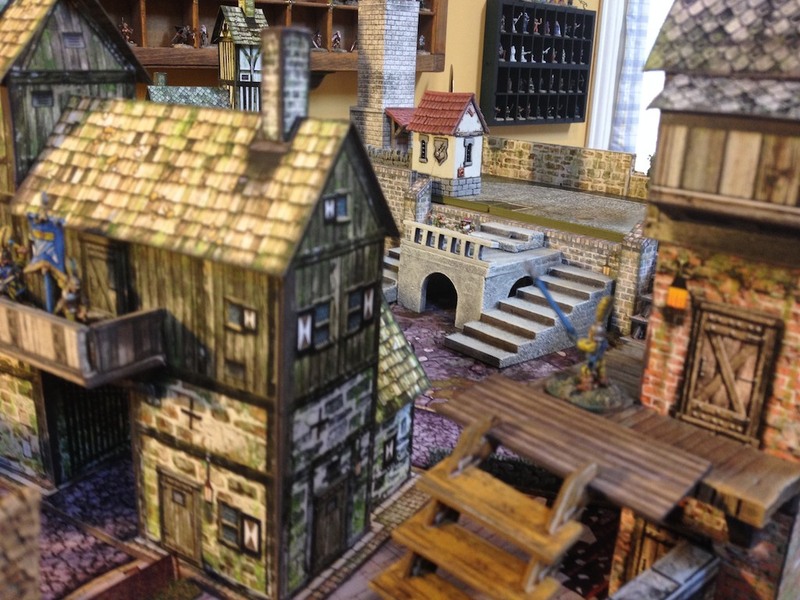 Some of the buildings and features appeared on another recent ‘Fantasy Venice’ attempt which follows a similar theme to this setup. 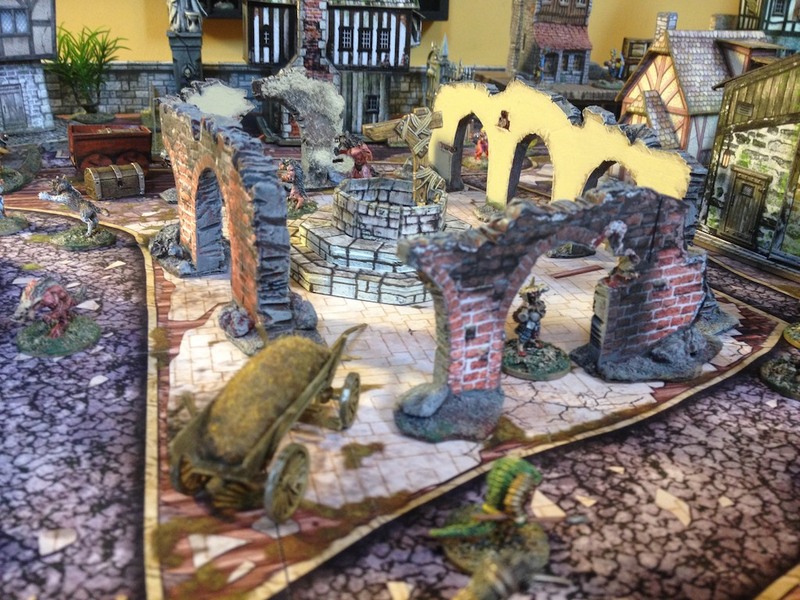 Some German Infantry (plastic HO/20mm scale) test out some Dave Graffam paper ruin terrain that has been based and bulked up with foam core. 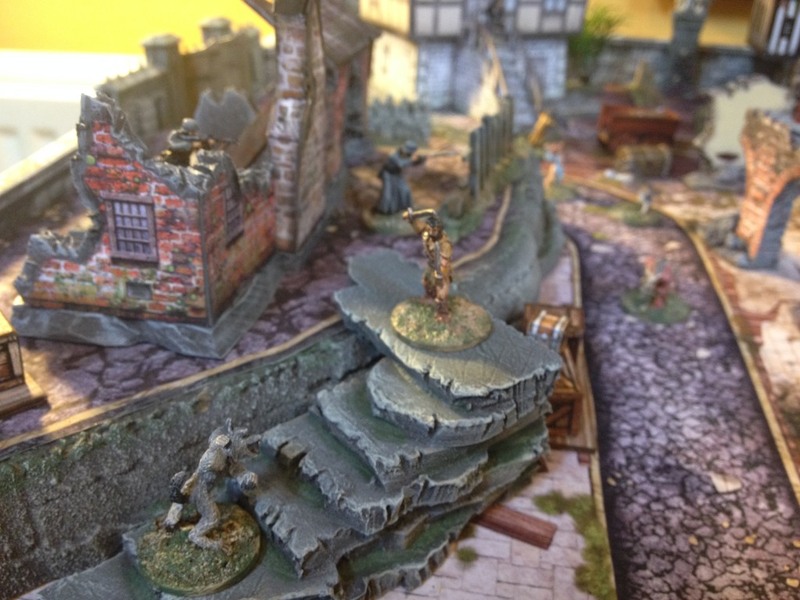 In the foreground a lone Splintered Light hero awaits a Blue Moon werewolf’s advances. To the right you’ll just see the side of a well. 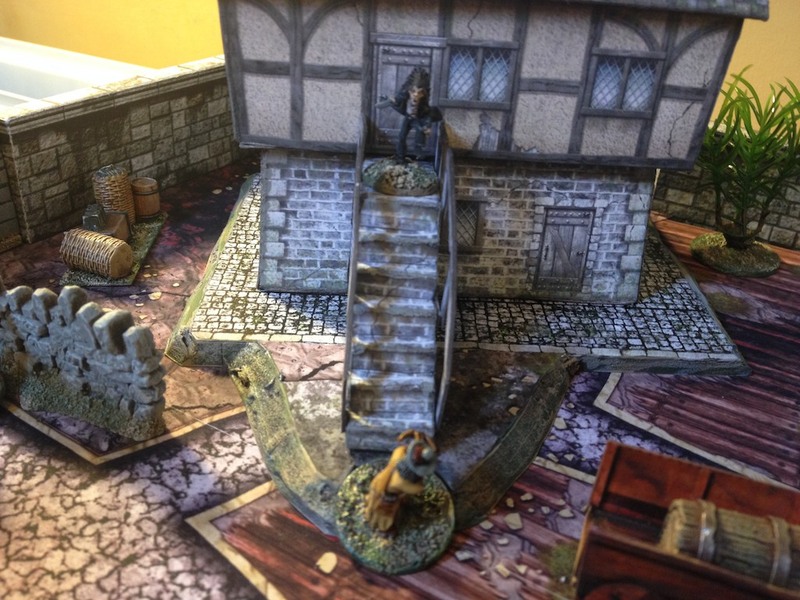 This is one of the feature items from the Battlesystems Fantasy Terrain Kicktarter set. It scales fine for 15mm. I wasn’t too keen on the ‘shallow’ steps so this has been bulked up a bit and painted to match. A nice Dave Graffam building with removable roof and upper floor with printed internals. 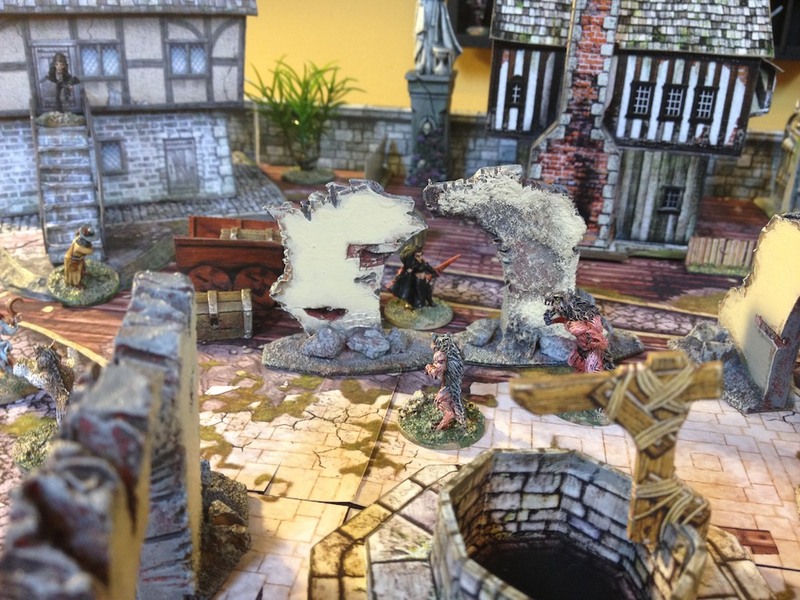 This Ozmy Vamp is about to get nailed by Van Helsing’s silver crossbow bolt. 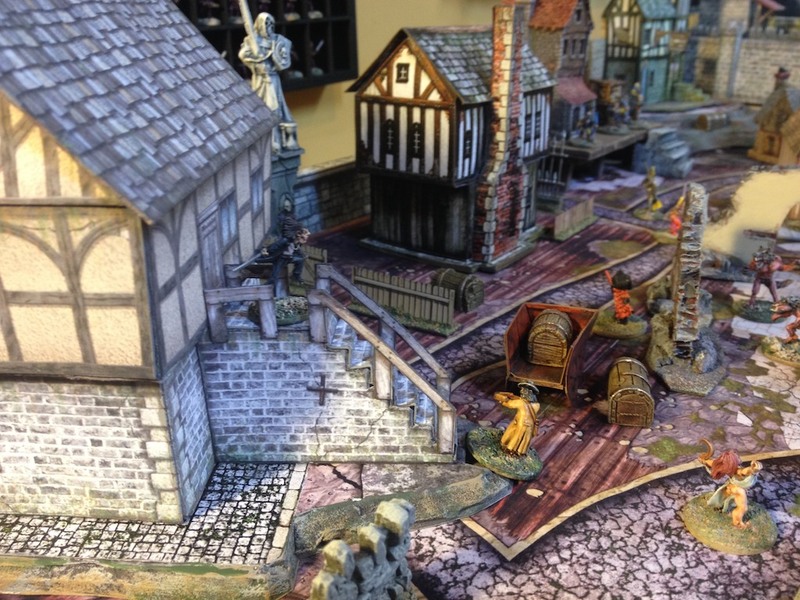 A couple of the Town Guard watching over the Games Workshop plastic terrain from the Fortified Manor House set – which has a lot of useful bits for 28 and 15mm use! 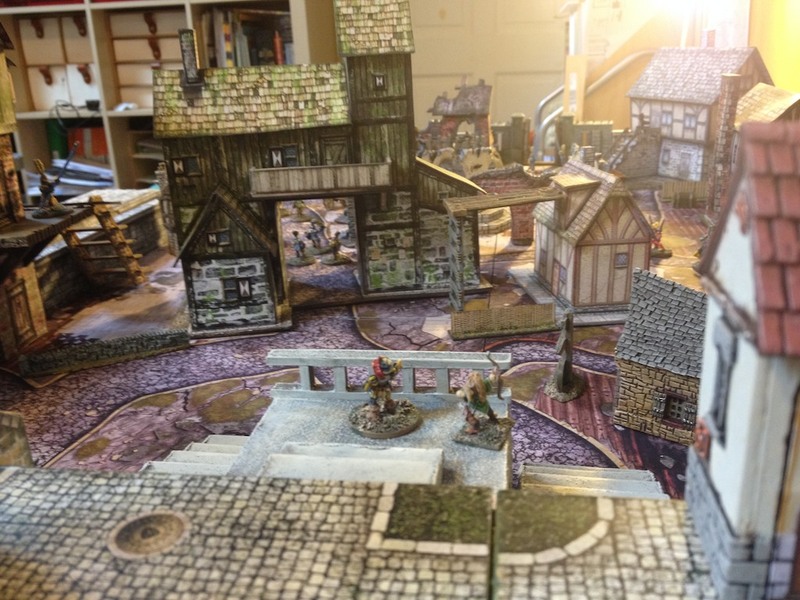 I have a thing for platforms and walkways which extends into fantasy from Necromunda influences. I think it’s the 3d aspect that appeals… only if I could work out a way to make these roof top walkways more stable. At this end I was trying to create a raised area for the town – a large esplanade area next to the city wall. A rather crude bit of scratch terrain in the centre worked out okay (foam core). Flexible with the stairs being workable at different angels to the central arched hub. 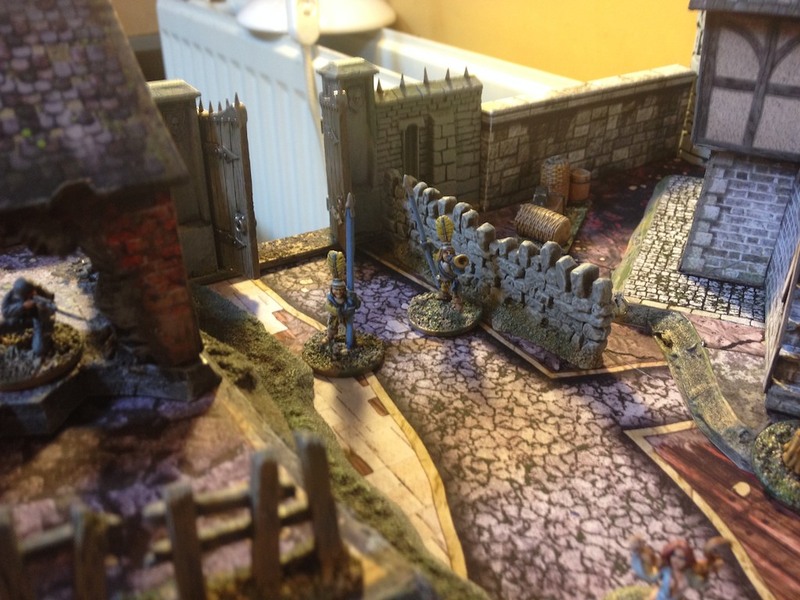 A 15mm.co.uk resin house to the left, Graffam card at the back and a bit of the GW plastic Fortified House on the right. The well again. I was quite please with the ruined archways that help create this central market place space. They are based on Dave Graffam ruins and I originally made them ‘as supplied’ but they were far too flimsy and thin looking. 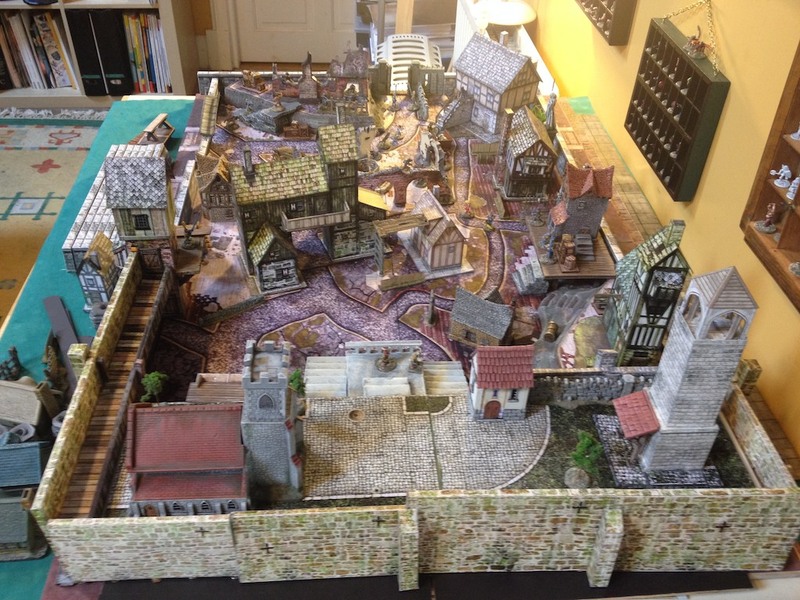 I stuck them to foam core, cut, textured and painted and based them up to make a modular set of terrain that I think will work well in fantasy or world war theatres. To the left, very nice Dave Gaffam. 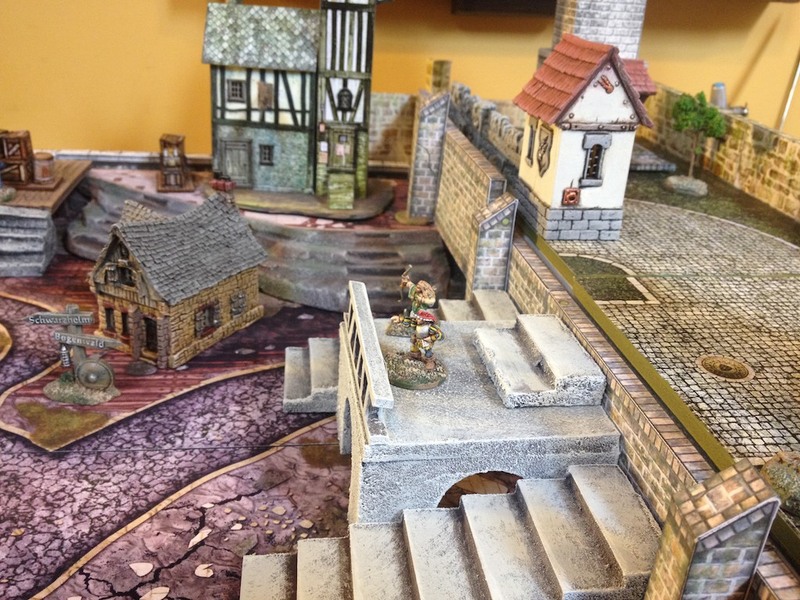 Stairs leading to the wall tower are what you can expect from Battlesystems (fine for 15mm) and a 15mm.co.uk resin house to the right (scalewise a little on the lean side). About 3’x2′ in total. 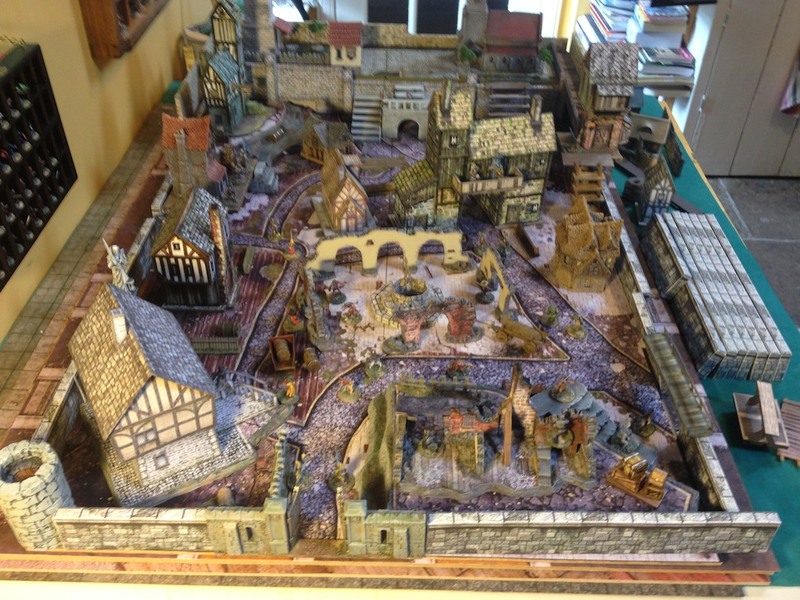 Should be enough space for a Mordheim/Frostgrave/Open Combat/Song of Blades and Heroes game. 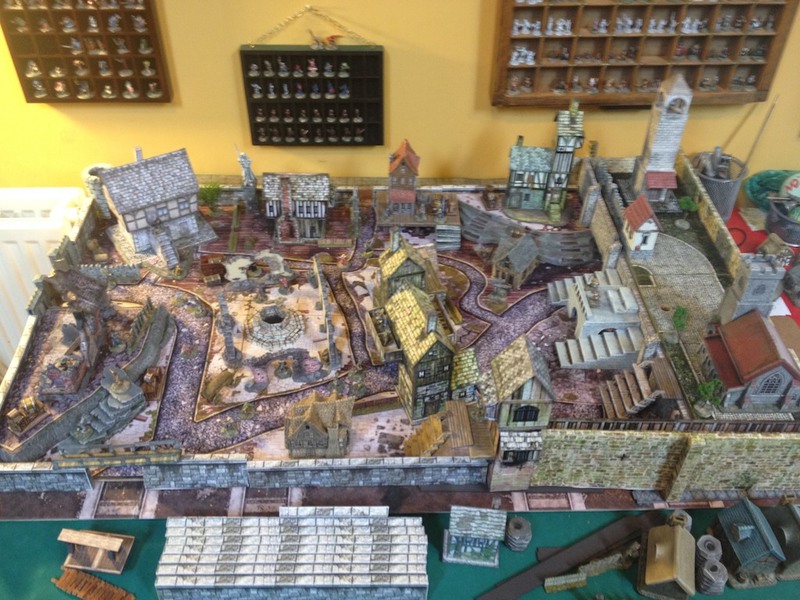 Glad to see you finally take some pictures of your 15mm town setup (or at least an example of). 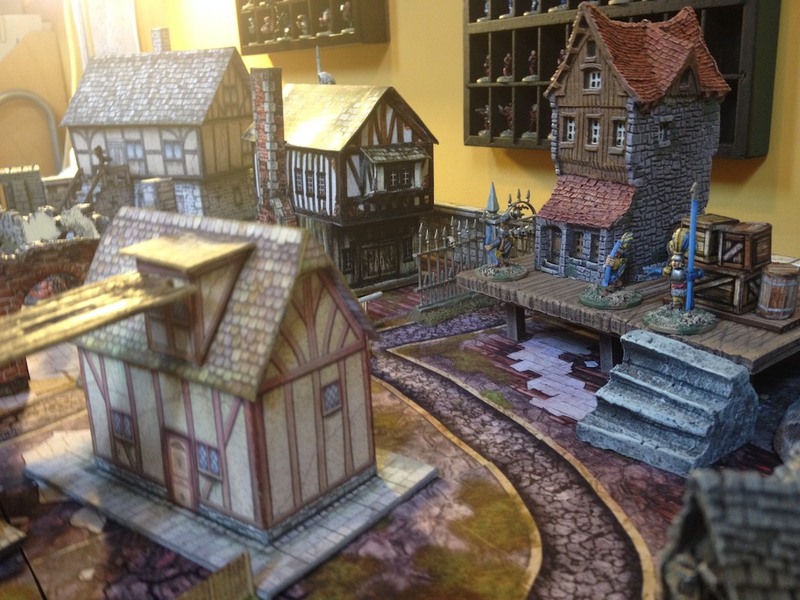 This is on my “15mm future project” list so it’s great to see some inspiration. Thanks Sam. Yes, it’s a bit more effort using the foam core but I think for things like the ruins and archways that extra bulk to the walls makes all the difference. A purist terrain builder would scoff I’m sure and just argue for 100% scratch building but I think the Graffam stuff does 2 things I need/want – 1) a template to work to and 2) a texture that both blends with other Graffam terrain and is also convincing enough that I don’t need to spend extra hours scratch building! Wait till you see some of the Sci Fi stuff I’ve been doing in the meantime – Foam Core Overload! Looks like a table that is great fun to play on! Thanks. Hope so. 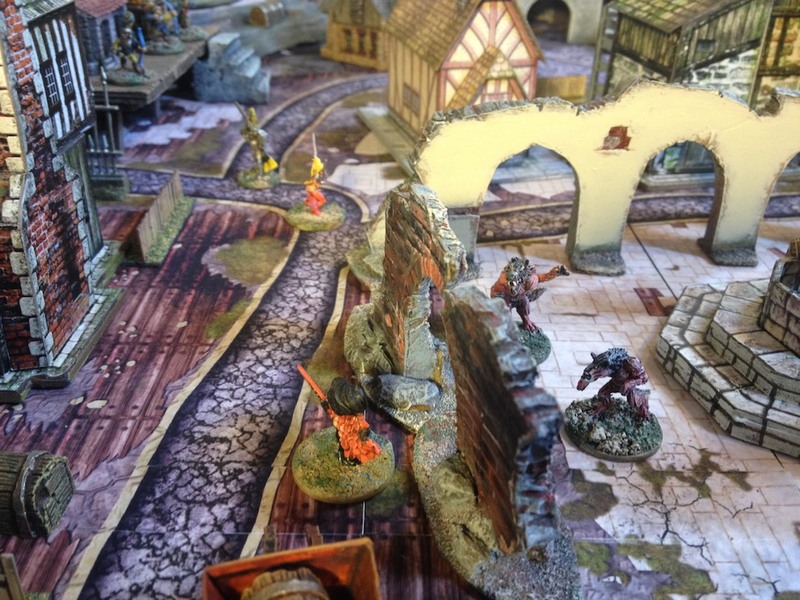 Certainly not as pretty as your terrain though! Gorgeous. What on earth are you doing looking at my blog on Christmas morning? Go and eat some mince pies!